Dogs usually attack cats due to either predatory instinct or status-related issues. 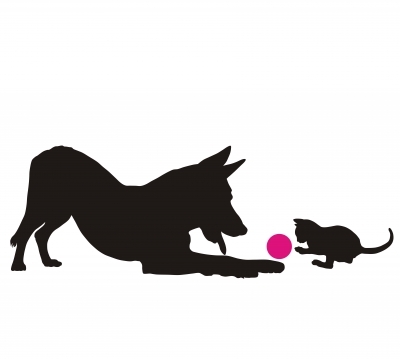 A dog that was not socialized with cats as a puppy may view them as prey, particularly if a timid cat runs and this motion triggers the dog’s chase reflex. A dog may also feel that he has lost status either when a new cat is brought home or a resident cat comes home after a visit to the vet. Also, when a dominant pet becomes ill or dies, other household pets may scramble to fill the status void, triggering fights. Dogs are more inclined to abuse shy, timid cats. Bullying behaviours can range from posturing to full chase and attack. Some dogs have great difficulty giving up the immediate gratification of the chase even for treats or praise. In such cases, a more comprehensive counter-conditioning strategy can be used to reduce the dog’s predatory urges. Supervise encounters between the dog and the cat, and keep the dog on a leash to stop him from running at the cat. Reward the leashed dog with treats or praise whenever he’s in the same room as the cat. Do this regularly for 1-2 weeks and then occasionally thereafter to maintain the positive association. Keep the animals separated using baby gates or closed doors when you aren’t around to supervise, and keep the dog leashed in the presence of the cat until you’re sure that the dog can control himself. Eventually, the dog will be more inclined to react to the cat’s presence by looking at you in the hope of praise or a treat than chasing the cat. Ideally, fights should be prevented altogether, but if a fight does break out, it needs to be stopped as soon as possible because the cat could be severely injured, and the dog may sustain scratches to his eyes or worse injuries if he is small. If the dog is small, you can just throw a blanket over the combatants or wrap the dog in a blanket or thick towel and carry him out of the room. Pulling the dog away by his collar is not recommended, as he may whip around and bite you in the heat of the moment. Yelling is also a bad idea, as human shouts may increase aggression rather than decreasing it. After the fight, ignore the aggressor (or both pets if they have been equally culpable) for at least half an hour. This signals displeasure and ensures that you don’t inadvertently reward the bad behaviour with extra attention. Reference: Shojai, Amy D. (2005). PETiQuette: Solving Behavior Problems in Your Multi-Pet Household. New York: M. Evans and Company, Inc.